The rumble following Lim’s Lightning’s rousing maiden victory in the IRT Juvenile Stakes (1200m) has grown so loud that many think he will take some beating in the final Leg of the Singapore Golden Horseshoe series this Friday. The facile four-length winner may be up against this year’s cream of the two-year-old crop (fellow Leg winners Pennywise, Streetwise, not forgetting other exciting prospects like Siam Vipasiri, Mr Hooper and Autumn Assault), but the way he stamped his authority in the third Leg exuded that wow factor only the smarter ones among his peers can do. Trainer Steven Burridge is trying to keep a lid on, though. The Australian put the bridle on the 2016 champion 2YO Lim’s Racer, another one for the Lim’s Stable, but the filly – who has recently been transferred to Daniel Meagher – has not really set the world alight post-juvenile, other than winning a couple more up to Class 3 level. Lim’s Lightning (Ryan Curatolo) races away to an easy win second-up. Burridge would rather wait for Lim’s Lightning’s run – only his third start – in Friday’s $325,000 Group 2 Aushorse Golden Horseshoe (1200m) before sticking any label on. “I’m very happy with the way he has come through between runs. He has trained on nicely,” said Burridge who has two Aushorse Golden Horseshoes to his name – Pitstop (2012) and Lim’s Racer (2016). “He drew a good barrier (two), which is a huge factor, but we will still need luck in the running. It’s a very competitive field. “He drew a wide barrier at his last start and needed a bit of luck. He couldn’t get in and I thought he couldn’t win, but he still won a nice race. Last-start winning partner Ryan Curatolo is also thrilled at the excellent chance of notching his first Group win in Singapore. The US-trained French jockey has taken Kranji by storm since moving from Macau in January, currently sitting in sixth place on 26 winners despite having his momentum interrupted by injury and suspensions for careless riding. A noted form student and pedigree buff, Curatolo has delved deeper than just his one winning combination a month ago. “If you take a look at his breeding, his sire Lope De Vega is by Shamardal. Both father and son won the Poule d’Essai des Poulains and the Prix du Jockey Club in France, which are a mile and a 2100m race,” said Curatolo. “He has a very good pedigree and I think he will get even better over more ground. He is a very promising horse. “No doubt, it won’t be easy on Friday as it’s a very competitive race. I will leave it to the trainer and (Lim’s racing manager) Mick Dittman to decide what to do, but the good draw is a huge advantage. The horses to beat have drawn 15 (Toosbies), 16 (Autumn Assault) and 17 (Siam Vipasiri)! “To me, Siam Vipasiri is a very good filly. She missed the kick at her first race (fourth Leg, the Inglis Ready2Race Stakes over 1200m on July 1), but she ran on very well to finish second. “But my horse was also very impressive at his win. Everything went his way that day, it was perfect, and hopefully, we get the same perfection in the Group race. 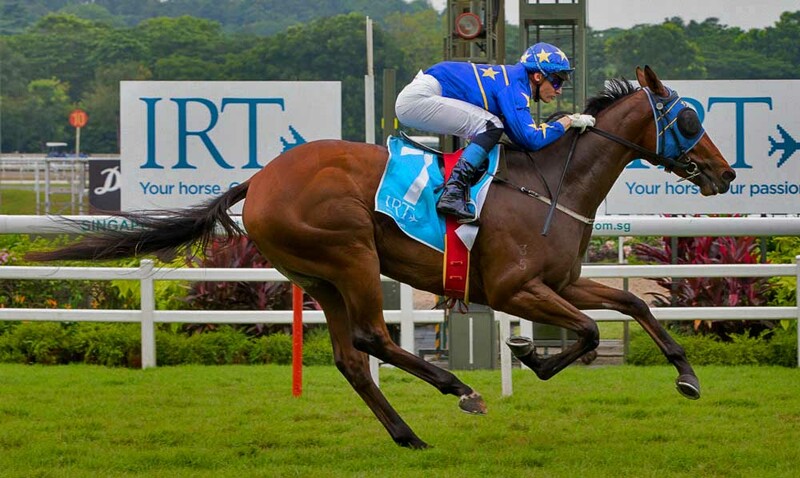 Should he come up short in the Aushorse, he still has Sunday’s $1.15 million Group 1 Emirates Singapore Derby (1800m) to add that first feather to his cap. Curatolo, who won two Group 1 races in Macau, is again linking up with the Lim’s Stable with the ride aboard Lim’s Regard for trainer Mark Walker in the third Leg of the Singapore Four-Year-Old Challenge. Curatolo did score a stunning breakaway win with the Red Giant four-year-old five starts back in a Kranji Stakes B race over 2000m, but the chestnut’s form has tapered off since. “I gave my word I would support Mark Walker and the Lim’s Stable in the Derby. It’s not an easy race for Lim’s Regard, but I’m feeling good about the ride,” said Curatolo who had to turn down the ride on Countofmontecristo (his ride in the second Leg, the Charity Bowl when they finished fifth). “He’s drawn well in six. I will talk to Mark and we may try something different with him.